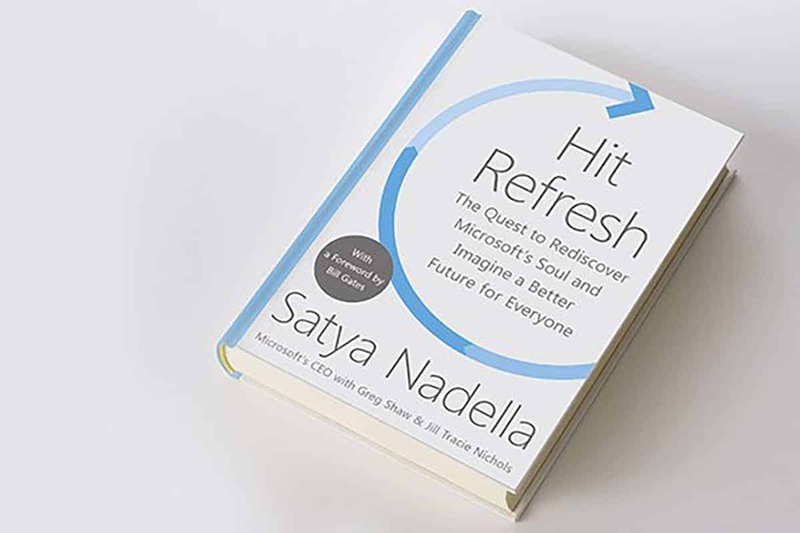 Find this Podcast “Hit Refresh by Satya Nadella Discussion – Forward and Chapter 1” on the ThreeWill Soundcloud, Stitcher, and iTunes. Danny Ryan: Hello, and welcome to the Two Bald Brothers and a Microphone podcast. This is Danny Ryan, and I’m sitting here with Tommy Ryan. How are you doing, Tommy? Tommy Ryan: I’m doing well. Good morning, and happy day after Fourth of July. Danny Ryan: Yes, it was fun last night, spending time in Marietta watching the fireworks go off. It’s always a good show. Tommy Ryan: A bow tie. Danny Ryan: A bow tie, and it looked pretty ridiculous. I went out with Kaley on our date night, and we saw that at Target, and we had to pick it up. That’s what we ended up doing. What’s the Tesla Model 3 tip of the week? Tommy Ryan: Well, one of the favorite things I like about the car is when you come to a stop and open up the car that it actually mutes the music, brings it down notch. Tommy Ryan: For those that like to listen to it a little bit louder it’s very convenient. Danny Ryan: When you’re blasting your Def Leppard it turns it down a little. Tommy Ryan: That’s right. Then when you get back in it turns it back up. Danny Ryan: It turns it back up, nice, very nice. Then, later on today we’re spending some time in your garden. My version of the Ryan family is coming over, and look forward to spending some time over there. Tommy Ryan: Some gardening 101. Danny Ryan: Yes, the girls will love to do that. That sounds like a lot of fun. What we wanted to talk about was we had been reading the Hit Refresh book from Satya Nadella. Chapter-wise we’re more than halfway through, but book-wise, if you look at it, we’ve just finished up to about page 120. If I look at the book it looks about halfway there. Wanted to maybe hit some of the highlights from reading the book, and talk through some of the internal conversations. Maybe some of the highlights from the internal conversations that we’ve been having, but go through that. I guess to let people know, we have been meeting up every Tuesday at lunch, and getting together to discuss one of the chapters from this book. The book itself, it starts off with an introduction from Bill Gates. It also has a neat picture. I can remember the day when he took over the reins from Microsoft, and it’s the picture from February 4th, 2014 when he was introduced as Microsoft’s third CEO alongside Bill Gates and Steve Ballmer. Now, this was a big. What did it mean to you when you heard this news and as you heard that Satya was going to take over? I guess, initially, what was the response? I can share some of the things that came into my mind. When this happened what did you think about it? Tommy Ryan: Overall, I thought it was good. I thought there’s a little bit of a swinging of the pendulum in terms of the style of the leadership. Early-on he seemed to be a genuine, empathetic leader. Tommy Ryan: The book kind of gets into that. It’s just neat to see how much he cares, and at the level that he’s at in an organization that size it could easily get pretty sterile as a leader, and just a lot of pressure to make sure you keep the legacy going there. He’s done such a wonderful job. Now, I didn’t know him before that. I really wasn’t that deep into knowing the different levels of leadership at Microsoft and knowing that he was in the running, except for when they started publicizing that. Out of the ones that they had to choose from, I’m glad they chose him. Danny Ryan: Anyone but Kevin Turner. He’s got a different style, and [crosstalk 00:08:38]. Tommy Ryan: Yeah, it would be more of the same. Tommy Ryan: Sure, it definitely speaks to that. Danny Ryan: … it really should reflect the company itself. I think it was a good move on their point. He had a long time within Microsoft, but I think they also wanted to get back to, when it was originally announced, he’s got a bit of an engineering background, which I felt like they had gotten a bit away from. [crosstalk 00:09:14]. Tommy Ryan: Right, more like Bill. Danny Ryan: Yeah. More of like the geeks wanted to rally around the geeks, and so putting him back into charge. In as much as Steve Ballmer had done an awesome job getting into the enterprise, and it’s a very difficult thing what he was able to pull off, I think. This is really where him coming in was a reaffirment of the original Microsoft that I think a lot of people had fallen in love with Bill Gates and the original story. Tommy Ryan: Yeah, he kind of coins it as finding the soul of Microsoft. Danny Ryan: Yes. I’ll go ahead and get us running into this. The first chapter is, basically, the background on his story. This is for folks who don’t know. When we go through this book together as a team I sort of walk through each of the different chapters and try to pull out some of the things that I saw and wanted to discuss with the group. The first thing he mentions is not long into when he started off as a CEO he had this meeting called a senior leadership team, pulling together a diverse group of people and some of his experience that he had. He mentions a lot of the people who are in that group, a very prominent and important group of folks within Microsoft that represent the overall leadership team. It was good to see Scott Guthrie, the red polo, he’s part of the group. Tommy Ryan: Yeah, the Tiger Woods of Microsoft. Danny Ryan: He mentioned getting together as a group and some of his first experiences and how the group knew a lot about their business background, but not very much personal, not very much about each other. He had an exercise, brought in a doctor, and sort of he asked a question to question challenge the group, and nobody jumped into it. It was sort of telling that risk of failure was a part of this group. It was interesting to see sort of him try to understand the group and the wanting to understand their personal passions and philosophies, to not leave that half of their life at home and bring that with them. Tommy Ryan: Yeah, I like that. It kind of speaks to when we think about work-life balance and kind of be integrated. We will want to bring our personal values into the work that we do and not have to switch into being a different person when we come to work. Tommy Ryan: Yeah, that’s so important. It’s awesome to see at the level or a scale of a Microsoft. I think that’s typically what you find in smaller companies. I think it’s easier to connect with that and create a culture of, “We’re here for a greater purpose, and there’s too many hours spent at work to feel like you’re just punching the clock.” To reenergize that to say, “This is more than a job. This is something that we bring our full self, and we’re excited about the mission of what we’re trying to do.” That’s hard to pull off, and it’s interesting to see how he does it at the level of a Microsoft. Danny Ryan: He says, “Ideas excite me. Empathy grounds and centers me.” This was one of the favorite stories that I’ve read so far. It’s the one about, “Ironically, it was a lack of empathy that nearly cost me the chance to join Microsoft.” It’s the story about when he was being interviewed, and he gets asked, “Imagine you see a baby lying in the street. The baby is crying. What do you do?” He responds without very much forethought and he says, “You call 911.” What an engineering response. Guy responds, “You need some empathy, man. If a baby is lying on the street crying you pick up the baby.” It’s just interesting to hear that. Then he starts to pull into his first son, Zane, and how that changed him and changed his family with having a child with special needs, and gets into that. I think this finds a special place in my heart just learning more about what his background is there and how that’s changed him. Having something where I think he probably had a very successful career, everything was going his way, and then to have something like that happen to you where you weren’t expecting it. Tommy Ryan: Yeah, you can definitely feel for that and empathize with that. I think it’s neat how he brings in kind of life experiences that inform you in the work world, that you don’t have to separate that, that that does bring to light what’s important to realize, is there’s diversity. I think that’s one thing that is interesting in the story along the way, that he kind of comes into in that engineering mentality, but he’s vulnerable enough to let the challenges and the problems of life inform him to grow, versus create, I guess, bitterness, or create rigidness that sometimes can be that reaction to the struggles in life. I’ve enjoyed kind of getting a sense of that. I’ve kind of felt that from just the news and the times that I’ve seen him talk, but reading the book I think shows more behind the scenes of kind of how real he is. Danny Ryan: This is, it says, “Don’t get me wrong. I’m anything but perfect, and for sure not on the verge of achieving enlightenment or Nirvana. It’s just that life’s experiences have helped me to build a growing sense of empathy for an ever-widening circle of people. I have empathy for people with disabilities. I have empathy for people trying to make a living in inner-cities in the Rust Belt to the developing countries of Asia, Africa and Latin America. I have empathy for small business owners working to succeed. I have empathy for any person targeted with violence and hate because of the color of his or her skin, what they believe or who they love. My passion is to put empathy at the center of everything I pursue, from the products we launch, to the new markets we enter, to the employees, customers and partners we work with.” That’s great stuff. Tommy Ryan: Yeah. It doesn’t seem like a public service announcement. It seems like something he definitely believes in and has been informed, I think, in his upbringing where he talks about his mom. I don’t know the exact words that were said, but, basically, enjoy life and do what brings joy, versus his father being a little bit more of the logical side, more the mechanical do the job and perform. I think he’s naturally, it seems like that natural response is an engineer, but has been heavily influenced by his mom to bring more to it, to bring more the empathetic, kind of soft skills of leadership. Tommy Ryan: What’s interesting with Microsoft is that being able to have the courage to go beyond what they have been comfortable with, which is kind of the packaged software, selling licenses of software that are kind of long-term use, versus the subscription model and the cloud, which was not something they invented, that they were kind of being hit with with their competition. They were able to embrace it in a way that spoke to what they care about. I kind of draw some equivalency there when I look at, all right, it’s an ever-changing world for us. We see people needing to get to the cloud, going from cloud to cloud, and that kind of point of lifecycle for organizations getting more out of their collaboration. It’s brought us into a lot of migrations, which is something that we always saw as someone else did. I think we’ve brought our passion for crafting a good solution, because there is a solution aspect of what you’re doing when you do that migration, and a passion for process, of having good process and being adaptive to the situation that we like, kind of taking chaos and creating predictability and control and choice in those situations. It’s neat to see how we’ve taken something that we normally would say, “Oh, that would be terrible if we had to do that,” to something that there’s a certain sense of pride of what we accomplish. That is kind of what you have to do to survive as a company and to evolve as a company, is to recognize where’s need, and where’s your passion? Get connected with that need, and I think Microsoft has done that well, and I think we’re adapting to that well too. Danny Ryan: Where are your unique gifts, too, because our background being more adaptive I think has made us uniquely qualified to go do some of the stuff that we’re doing right now. Danny Ryan: A tool doesn’t do it, that’s fine. We’ll write some powershell scripts or do something. Danny Ryan: This is interesting because we’re sort of getting into how empathy, and I think about this because we’re thinking about what the experience is and trying to get into for these organizations that we’re doing these projects for, how does it feel on the other side to be the person who is, “I’ve moved from …” A lot of people move from Jibe to Office 365. What does it feel like to be on the receiving end of that, and to think about how are we enabling them, how are they better off today than they were yesterday? I think trying to think of those things is important for us to do as an organization. Tommy Ryan: Yeah, that’s the empathy side. You’re trying to put yourself in their shoes, versus technically saying, “Okay, we moved the content.” That’s where we kind of started, and we’re evolving to have a bigger impact in terms of the experience on the other end. Danny Ryan: At this rate we’ll be done with this some time tomorrow. I’m just looking. Tommy Ryan: We’re on page 10? Danny Ryan: Yes, we’re on page 13. This is fine. This may be good for us to take it chapter by chapter. This will give us some materials to go through. We’ll also have in the middle of this, I think if we continue to go down this route, we’ll have the partner conference. I’ll pick up some things from there that I can share about what’s coming from Microsoft. If I look at the book and what he does, I think he wants you to know what his background is. He gets into his family life growing up. My overall impression of reading this, I think number one is his parents where his dad was in the, what did they call it? He was in the service, basically, the Indian Administration Service. There wasn’t a test he couldn’t take that he wouldn’t, he could pass every test. Yet, he didn’t have those expectations on him. He didn’t put Satya up to that same type of [inaudible 00:24:56]. I think he was very empathetic with him growing up, and probably recognized he had his own unique skills. It was good to hear he didn’t start off wanting to be a tech. He wanted to be a professional tricket player. Can’t even say the word, cricket player. Him falling in love with that, and learning some about what his mom had to do with giving up her career in order to raise the family. I think he learned a lot of things, just like you and I from our parents, about the choices that they made and what the impact of those choices could be on us and on others. Anything else as you read through this? It was good to hear he had a Catholic school experience like you and I. You went in elementary school at Saint Joseph? How long did you go? Tommy Ryan: Yeah, kindergarten through eighth. Danny Ryan: Kindergarten, oh, you went all the way through? Danny Ryan: Okay, cool. Then it was interesting to read all the people who went to some of these schools, oh my goodness, probably the formative education they were given. Tommy Ryan: I take that back. It might have been first or second grade that I started, but it went through eighth. Danny Ryan: Okay. Dad will let us know. [crosstalk 00:26:29]. Tommy Ryan: Some homework for you, Dad. Tommy Ryan: Yeah, it’s crazy. Danny Ryan: … that were a part of that school that he had went to. Then he just sort of goes through and shares more about his background growing up and how he ended up over here in the States. I think the thing that you wanted to take away from this is it sounds like the story of someone from India coming over into technology and doing well within a technology business might sound like a story everybody’s heard before, but I think the thing that I learned from all of this was that he was more, and I think they have this as the intro of the book, he was more of a humanitarian than he was a technologist. That brings a different viewpoint of what he focuses in on as an organization, and really gets us into he’s focused in on the culture, which we’ll get into later on. Tommy Ryan: Yeah. I think it creates a certain amount of balance that naturally an organization that’s a technology organization is going to have more the logical side of things, kind of the right brain side of things. He can bring the other side to create balance in the environment. Tommy Ryan: Green card, yeah. Danny Ryan: … rules and regulations of the system. It was also a very unselfish thing for him to do. I think for us as I look at this it just gives us a peek into his background, his family life with his son Zane and how that’s changed him, a background on who his parents were, and the risk that he had to take. It gets me excited to learn more about him and how that background has made a change at Microsoft. The next chapter is Learning to Lead, and we’ll just cover this the next time we get together, but this sort of gets into his leading at Microsoft. We’ll cover that at the next get-go. Sound good? Danny Ryan: All right, thank you everybody for listening. Next time we get together we’ll talk about chapter two. We’ll just take this chapter by chapter. At least this gives us some stuff to talk about. We got sort of into this in the middle of this, but it’s just sort of what does this mean to us as a small Microsoft partner, and what does learning more about what he’s doing at Microsoft, how does that impact us, most important culturally? Then just sort of as a partner, how can we take some of the things he’s doing and apply that to what we’re doing here at Three Will? Danny Ryan: Cool. Thanks everybody for listening. Have a wonderful day. Tommy Ryan: Take care, bye, bye.